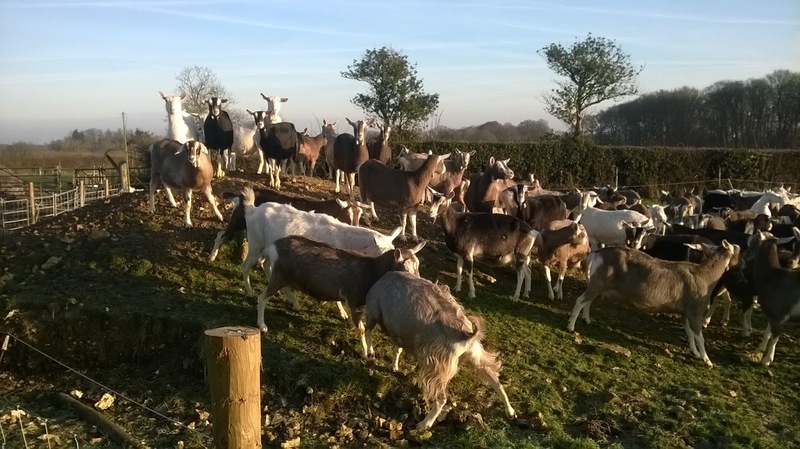 From the North Downs Area of Outstanding Natural Beauty we bring you the best milk, cheese and meat. 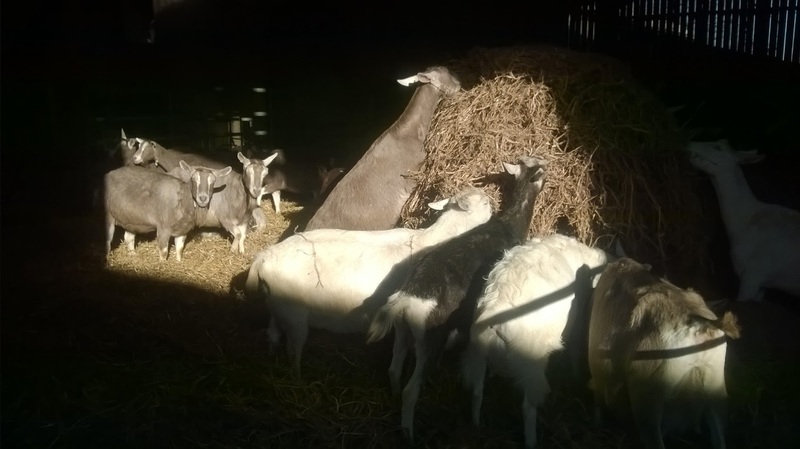 Traditional responsible and ethical farming means free range access to grazing with all feed, including hay from our own ancient meadows, GM and chemical-free and blended by us. We know the name and personality of every single member of our pedigree herd of happy healthy goats. We love - and thoroughly spoil – every one of them, male and female alike. 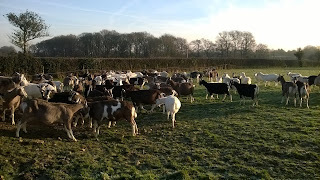 Well, it's been rather a glorious week for goaties! Hard frost and sub-zero temperatures have meant that all that horrid wet ground and squishy mud has gone hard ... great for little goatie feet! And so, for the first time in ages, most of the herd went running outside yesterday morning to enjoy the winter sunshine. Plenty of people in the field.. Some playing up their mountain .. 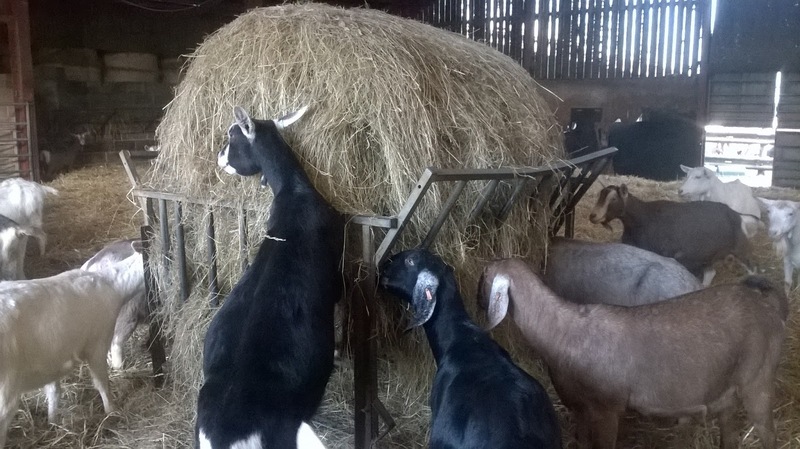 While others took advantage of the peace in the barn to tuck into that delicious haylage..
A bale of pea straw ..
Or the freshly scattered barley straw .. So much choice! No wonder there were a lot of fat goatie bellies tonight! Our oldest lady, Tammy, often trots round to the back of the milking parlour hoping to be let in and given a treat. Like many of the older girls, she is very partial to the odd banana but lately she has taken a liking to spiced black tea for some reason. She has tried to help herself to my cuppa on several occasions and I have lost a couple of nice mugs as she brought them crashing to the floor. So, this morning when she started hunting round for her morning brew, I made her a mug of her own. Nothing like warm spiced tea on a cold January morning ..
David has been away at a farming machinery show for a couple of days, so I have been milking solo in the evenings. On the whole, the girls were pretty well behaved, but there was the odd naughty person who took full advantage of a single human. 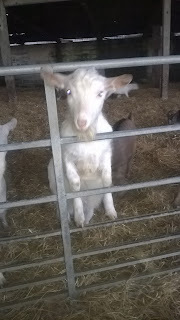 The empty stall has been vacated by a naughty goat who jumped off ... So, only natural that the girl next door has to check out if there is any food left over .. Finally, I would like to introduce one of our little stud-boys-in-waiting .. Ivanhoe. We decided that we would keep 2 youngsters this year - Ivanhoe and Magellan. 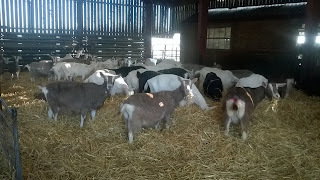 They are growing well and hopefully will be ready to work next year with our lovely Hilton. 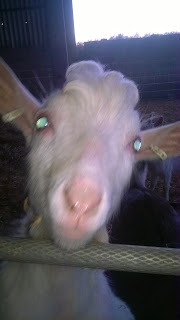 Ivanhoe was quite nervous to start with but, as you see, he is now very friendly and keen to come across and see you. He has quite an interesting hairdo going on .. I need to get a good photo of it .. Sadly easier said than done! 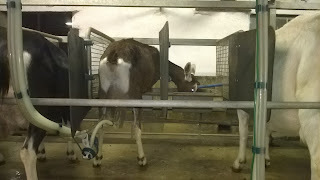 New raw milk consultation from the FSA. Please find time to read it and submit your views. It's essential that everyone who is passionate about raw milk is heard! Sadly, Ellie's Dairy has decided to take a break from Borough Market. But you can still find us around London and Hampshire at our weekend Farmers' Markets - please check out our Farmers' Market Schedule below for all the details. Into the 21st century we go! 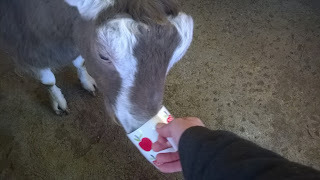 Ellie's Dairy is now on Twitter.